2013 was a productive year… but it was a hard year. To paraphrase a colleague, “We got alot of amazing stuff done, but the journey sucked.” For me… I worked too hard, and I worked out too little. I achieved more goals than I thought possible, but I also felt like a failure more than ever before. I spent more time with my family, but too seldom was I able to give them my whole focus. I invested in growing as a writer, but I didn’t write consistently enough or finish my book. I got more accomplished in my waking hours, but at the expense of the hours when I should have been sleeping. And… I learned that I am pretty good at “preaching” to others about things like having an empowered career, servant leadership, and time management, but that I am terrible at putting my own “message” into practice. 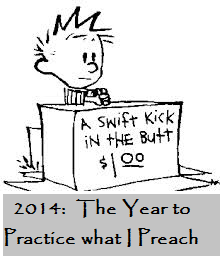 So while 2013 was a year where I further developed my ability to preach… I declare 2014 to be the year I commit to practice. So for my first blog entry of the new year, I am writing directly to myself. I am fortunate to be fairly innovative and creative by nature, and these gifts have provided me with many blessings and with a lot of success. I can live in a world of possibilities versus problems, and see opportunities where others may not. I can see connections and patterns from seemingly unrelated data, experiences, and relationships that allow me to solve seemingly unsolvable problems. I have an adventurous, risk-taking spirit that pushes me to “go big or go home”, paving the path for breakthrough innovations and business success. That said, out of our greatest strengths will rise our greatest weaknesses (and in times of stress, these weaknesses will have a tendency to overwhelm the strengths!). My “world of possibilities” can allow me to try and juggle too much at one time, risking “dropping the ball”. “Solving unsolvable problems” is fun and addicting, and there are an endless supply… I see puzzles everywhere, and struggle in picking and choosing the truly important ones upon which to focus. My confident “risk taking” has been key in my successful pursuits of amazing innovations, but I sometimes take too many risks in too many places and make little things more complicated or more “dangerous” than they need to be. This constant tension, while leading to some awesome moments along the way, also creates an immense amount of stress and frustration. I dream so big and so broadly in so many places, but struggle to make choices and to prioritize. And it is not like this is rocket science… if I read my very own blogs, there are countless ways to address and to improve in these areas. It is all about being disciplined and choiceful in how I invest my time, so as to insure that I am investing in the places that are truly important and impactful. That is not to say that I need to become the gold standard of structure and discipline in all aspects of my life… I am not wired that way and never will be. However, I need to be disciplined about my blocks of time, so that when I am allowing myself to be creative, adventurous, and innovative that I am doing so in a purposeful and not a whimsical way. For 2014, I am not making a resolution to change who I am, but rather to resolve some of the CHAOS that I create so as to take control and to make sure that I am deliberate in acheiving what is truly important in the absolute and not merely in accomplishing what is urgent in the moment. Choose a Theme for the Year. I recently read a great article that talked about not necessarily making a resolution for the year, but rather choosing a “theme”. What are one or two words that describe my overall focus for the year in not only my career, but in my relationships and my personal development as well? For me, my words are going to be “servant leadership” this year, and as I allocate my time and energy I will first make sure that I am investing in ways that are consistent with that theme. Have Clear Goals and Track Them. I am stating clear and measurable goals in 5 important roles for my life in 2014, writing them down and tracking progress weekly. I will not share the specifics here, but I am making a small number of important and focused goals to help me be a better 1) Husband, 2) Father, 3) Author, 4) Athlete (i.e. 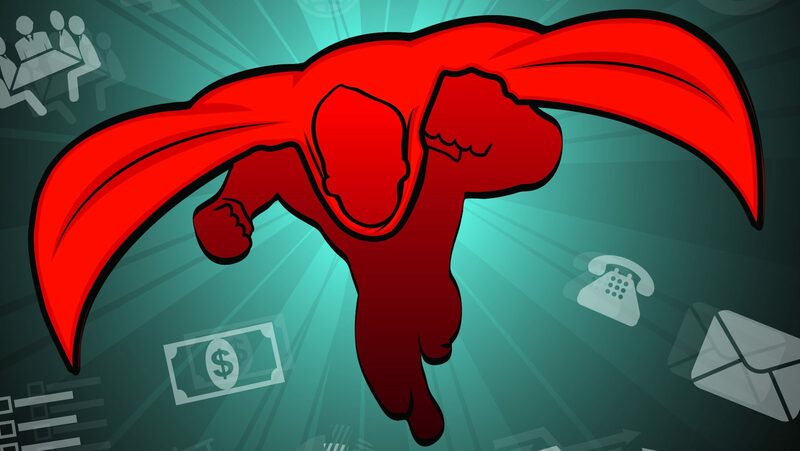 take better care of health), and 5) Innovation Leader. These will be specific, inspiring, and measurable, and I am posting them where I will see them constantly. There is a lot of “clutter” in life that can easily become the focus and priority and get in the way of what is truly important… this is my way of making sure I don’t lose track of the “real” stuff while being overwhelmed by the barrage of “small” stuff. Allocate and Prioritize Time. Time is the greatest asset at my disposal, and the one that I too often and too easily abdicate my control. Starting now… each Sunday, I will outline my big blocks of time to decide when I will be fully invested in my work, my relationships, my writing, etc. and do my best to protect that time. And if something comes up (as it inevitably will), I will reschedule the time and make sure that it is prioritized. There will always be a crisis of the day, and it is far too easy to just let the crisis win and to cancel rather than to reschedule the “personal time”. If not deliberate, the urgent will always supercede the important, and the aspects of life and work that truly should be prioritized fall away because they are not attached to a deadline. This can lead to, say, going a year without physical exercise for example (hypothetically, of course…). And on Monday mornings, I will do the same time allocation exercise but within the confines of my work week so as to block off times to focus on my big goals there and try to contain the time in which I deal with the clutter of email, etc. This sounds simple, but after existing for so long as a victim to my calendar rather than as an owner, I expect this step to be the hardest of all to change. Operate with More Doing and Less Talking. In my job, I spend an immense amount of time talking about work, but not nearly enough time actually doing it. On an average week, I spend more than 40 hours a week in meetings and almost all of my time physically in the office is spent talking about what we should have done, what we should do next, how we are going to get back on schedule, etc. And then I require myself to do the innovation and strategy work that I am actually paid to do in the evenings and over weekends. For this year, I am going to protect time during my core 40 (okay… realistically 50) hours a week to get work done. This will be mandatory time that I will block off on the calendar and I will even assign myself an agenda. Even in my blog this year, I plan to condense my thinking more and to produce shorter (well… after this one), more consistent in frequency, and more action-oriented themes than I did last year. More doing, less talking. Share My Focus and Goals with an Accountability Partner. I can unequivocally profess that I am not disciplined by nature and that I will always trend back to bad habits and to let entropy overwhelm my life. Therefore, I am going to choose someone who I trust and regularly ask that person to give me a not so subtle nudge if I start to veer off course. It is much easier to “fall of the wagon” when I am only accountable to myself, but much more difficult when I need to look someone else in the eyes. Sharing my plans, my goals, and my struggles will help to keep me honest, and also make me far more likely to consistently follow through.